Just think about it – a giant freaky metal cockroach and a living pile of grotesque garbage – wow that’s an awful, disgusting, gross pairing of two Pokemon… and that’s what my opponents pretty much thought as well, considering I went 19 W 6 L with this over 25 games in the past couple of days (ah finally got some time to play again). I will say that the caveat here is that I only faced four meta decks in the 25 games I played, and two of those were against Mike, and I know we were chatting a lot and maybe not as focused as I think we both had a couple of misplays. But still, this deck is very good – there’s a reason it came in second at Memphis, and I bet if Pram and Azul went at it again, it would surprise me if Pram came out the winner a second time. I know what you’re going to say: where’s N? I just can’t bring myself to run it. I don’t know how many Cynthia I’m going to put in the deck – maybe none – but I know I will not put N in this deck. I’m not giving my opponent extra cards or a hand refresh early in the game. I do only have five draw support cards – I really use the Ultra Balls as quasi Random Recievers to the Sycamores I need. I didn’t keep official track, but I’m sure I Lele’d for Sycamore more than anything else outside of Brigette. This is definitely a weakness, however, and I would guess that I would tech in at least one Cynthia after Ultra Prism comes out. Lillie had the highest proportional frequency of play (average number of times played / card count) at 57%, but I don’t think I’m going to tech in another Lillie because I would guess that I mostly used it on turn one. I am running GRI Garb. It hit the bench in 13 out of the 21 matches where I tracked the cards I played (I didn’t track the three I played against Mike because we were chatting and I donked one player on turn two and didn’t bother to count what I played for that as well). It had a 33% play rate, and that puts it in the middle of the pack as far as proportional frequency of play goes (10th out of 18 different cards). The matches where it hit for 200 plus damage stick out greatly in my mind, but maybe it might have served even better as a disincentive for playing Item cards. Maybe in some of those matches it worked as a soft, unofficial Item lock that inhibited the decisions of my opponent. At the very least, every second you spend thinking about Trashalanche is a second you’re not spending on how to beat me. Choice Band was the second most proportionally frequently played card at 48%. I’m definitely going to add another one. I am going to drop all four Enhanced Hammers as well. I love them in the current meta right now, but I think our dalliance with Special Energy right now will come to a quick end with Ultra Prism. The way I look at it right now, there’s going to be a lot of Metal at Collinsville, which means there’s going to be a lot of Volcanion to follow. IMO this means that there will be a lot less SPE. I think we’ll see a significant drop from the insane amounts of SPE we’re currently seeing in the top tier decks. Plus, their proportional frequency of play was 18%, the second lowest. What was very surprising to me that the only card lower was Guzma. It had only a ten percent proportional play rate. I played it in only five of the 21 matches I tracked (and really 22 because I know I didn’t play it in the match where I donked the other guy early), and I only played it twice once. I’m definitely dropping down to two Guzma, and I might even go down to one. This would be a prime candidate potentially to swap in a Cynthia and go down to a single Guzma. I know, it’s insanity, but I just haven’t played it much. Special Charge was 14th and had only a 26% proportional play rate. I’m going to add two Grass energy and drop one of the Special Charges. I am considering dropping Energy Loto, though, since GRI Garb didn’t attack much. I could drop those four, add in a couple more Grass energy, and maybe a couple of other fun cards too. Not sure about that though, as it definitely helps me grab DCE. I’m keeping Loto for now but will definitely think about swapping it out. It had a 37% proportional play rate (ninth overall). Brigette had the second highest proportional play rate at 48%. I just can’t add a second though. It’s great to have turn one, but rarely gets used outside of that. I just don’t need it that much. The final card that probably most people would consider a surprise is Super Scoop Up. I love this card, even though it only has a 30% proportional play rate (twelfth overall) and will NOT reduce the count of this card. It can help SO much, and not just picking up damaged Pokemon. You can use it to pick up something in the active so Golisopod can come in and hit for 120. You can use it to pull a Float Stone off of Garbodor so you can then play Lele again to get a Guzma or Acerola or Skyla or whatever else you might need. But the most fun way I love to use it: turn one play Lele for Sycamore. Then play SSU and if you get lucky you can then play Lele again and go get Brigette. This didn’t happen a whole lot, but it was awesome when I did get to pull it off and has to be a devastating mental blow to your opponent. SSU is the secret weapon in this deck. I’d highly recommend testing four of these in any meta deck you’re running – it might really surprise you. In my notes, I commented that I needed Evosoda multiple times. There were a number of times when I just couldn’t get the Stage 1 Pokemon I needed, whether it be Garb or Golly. I also noted a couple of times where I could have used a couple more Grass energy. Again, I’ll probably swap a Special Charge for a Cynthia when it comes out, and I may drop the Energy Loto in favor of something else, but this is what I’m sticking with now, and I’ll update you on how the new version does later in the week. Hey I just wanted to say that I had a go at your decklist for a little bit, and it was surprisingly consistent. Granted I can’t give the best analysis of how the games went on my end, but out of maybe 4 games or so, I won 3. From what I recall: Greninja couldn’t fight against weakness, Crabominable was strong but without max potions the recoil cost him the game. Now the next two games are summed up nicely: a spectacular flop, and a miraculous win respectively. Buzzwole: opening hand had Sycamore, no Lele, no Ultra, and all my Golisopod there….I might have jumped the gun, but I Sycamored everything and ultimately: Buzzwole took out the two Trashalache attackers I had left. In the next game: Tapu Bulu. Turn 1 had everything. Brigette, Trubbish, DCE, Lele, you name it. Opponent had nothing on hand on his turn so in the following turn I went Golisopod, energy loto (landed rainbow), choice banded him up, float stoned Trubbish, and that was game. One thing I learned from the Buzzwole match was that the deck should have at least 1 rescue stretcher. Maybe take down 1 Super Scoop Up for a Stretcher, but it’s a thought (you never know when it will be needed). As a side note: the Crabominable player also played Garbodor, so with my last hand having almost 5 items and a sycamore among them….I held onto my cards without a doubt. In the end, great deck! Thanks for the feedback Juan. Glad it did alright for you. Absolutely, Rescue Stretcher isn’t a bad idea, I could easily see swapping it for one of the Lotos, but I am totally infatuated with SSU. I’ve got a list of about a dozen decks I’m looking at for Collinsville, and right now this is at the top of that list. But thanks again for checking out the site and feel free to send me an invite on PTCGO sometime (IGN 21times). You’re welcome! I’ll be sure to add you when I can. But yes! If you can squeeze in Rescue stretcher, your deck should be ready to go without a doubt. 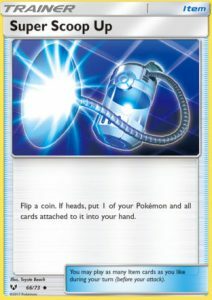 No matter how unlikely it may be, there might be some games were you are going to have to discard some Pokemon, be it Ultra Ball or Sycamore, games where your Golisopod and attacking Garbodor are in the discard due to knockouts, and it may prove to be costly. But I do understand Super Scoop Up’s role in your build. It’ll serve you well when you’re facing Zoroark Gx, which can be a bit troubling as well since he isn’t OHKO’ed by Golisopod’s Gx attack. Denying the prizes is as good as it gets. 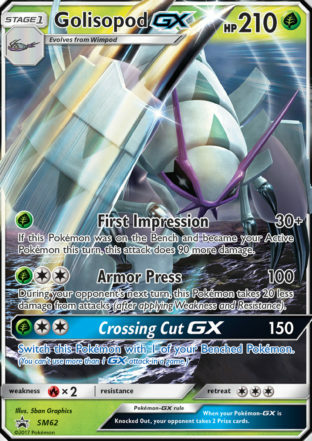 Also, is there an updated Golisopod deck that might be fun to play around with (the non-Gx variant I mean). Really loved that pokemon when it came out, and when I was playing with the fighting Bewear, the ability reminded me of him very well. On an unrelated note, I played around with the Ho-Oh/Vikavolt deck this past week and I would totally suggest Field Blowers for Mike’s build: it is absolutely needed there (at first I thought Choice band as well, but everything’s a 2 shot with Ho-Oh so Wishful Baton is quite the helpful tool).